"Great to assemble the night before and have ready to pop in the oven after work. Garnish as desired. Serve with Spanish-style rice." Prepare a 13x9-inch baking dish with cooking spray. Wrap tortillas in paper towels moistened with water; cook in microwave until soft, about 20 seconds. Stir mushroom soup, taco sauce, green chiles, and green onions together in a bowl. Fold chicken into the soup mixture. Spread chicken mixture into each tortilla, sprinkle small amount of cheese over portion of the chicken mixture, and roll the tortilla around the filling; place with the seam side down in the prepared baking dish. Spread remaining chicken mixture over the rolled tortillas. Sprinkle remaining Cheddar cheese over the chicken mixture. Cover baking dish with aluminum foil; refrigerate at least 12 hours to overnight. Remove baking dish from refrigerator. Keep dish at room temperature for 30 minutes. Bake in preheated oven for 30 minutes. Remove aluminum foil and continue baking until the cheese begins to brown along the edges, about 15 minutes more. 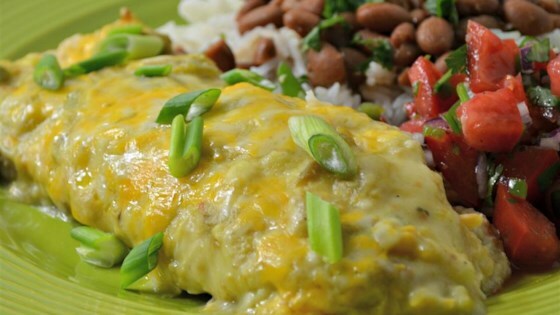 Enchiladas with an extra bit of goodness to them–cream cheese with jalapeños!